I've been searching the web for info about the steamliners, Tak Sing, Dai Loy, Fat Shin, and Macao, ferrying passengers between HK and Macao. Save for Fat Shin (because it was sunk and with big loss of lives), I couldn't find too much info on the other three. Anybody has some photos of the Tak Sing, Dai Loy and Macao to post? When was the ferry service discontinued? Permalink Submitted by David on Mon, 2010-05-17 22:53. I found this photo of Tak Sing, but a similar search for Dai Loy didn't return anything. Out of curiousity, what's your interest in the ferries? Permalink Submitted by Anonymous (not verified) on Tue, 2010-05-18 01:50. I was just reminiscing the numerous trips that I took with my parents to Macao when I was a toddler. The afternoon tea underneth the shady trees on the water front.....in Chinese we called the place "Nam Wai". The tricycle rides. The cobblestone streets. The smell from the area where they sold sun dried seafood. The crabs. The almond cookies, etc. Like HK, Macao was a much quieter and easier going place back then. I am kinda surprised that not much about the ferry-steamliners on the internet. Afterall, they were part of an important history of the two cities -Macao and HK. Do you have any idea when the steamliners' service was discontinued? Was each steamliner being phased out one by one or were they being phased out all together at once? Permalink Submitted by moddsey on Tue, 2010-05-18 06:38. Permalink Submitted by tngan on Tue, 2010-05-18 09:47. I used 大來 as keywords in Google and got this photo. I am unable to locate any photos of 佛山 (Fat Shan), 南山 (Nam Shan) yet. Back in the early 1980's I once travelled on the Nam Shan to Macau on a overnight trip. But subsequent trips was made on the Fai Tat (快達), which had been a modern day non-hydrofoil\jet ferry of the time. The Fai Tat made the trip slightly less than an hour and a half. With the older ferries it would take over two to three hours at their top speed. Permalink Submitted by 80sKid on Tue, 2010-05-18 10:55. The Princess Margaret was built in 1931 by Wm. Denny of Dumbarton for the LMS (London, Midland & Scottish Railway) route from Stranraer to Larne. She was 325ft long, 2838 gross tons, and carried 1250 passengers, with 107 first class berths, and 54 second. Her speed was 20.5 knots. She also ran some coastal cruises and trips to Bangor from Larne. In 1939, on the appearance of the new Princess Victoria, she was transferred to the Heysham-Belfast route, returning to Stranraer when the new ship was requisitioned for war service. She was reconditioned after the war, being converted to burn oil in 1952. She passed to CSP (Irish) when the railways were nationalised, and was withdrawn in 1961, when the new Caledonian Princess arrived. She was sold to Shun Tak of Hong Kong, renamed Macau, and used to the port of that name. Permalink Submitted by tngan on Tue, 2010-05-18 11:27. I remember this one. It was still in service in the late 1970's and early 1980's. I don't know where did she go when she retired. The Nam Shan (南山) I mentioned earlier appeared to a boat of the same era. Permalink Submitted by Anonymous (not verified) on Tue, 2010-05-18 15:39. Unfortunately my computer is NOT Chinese compatible, so I cannot get most of the Chinese names. "Nam Shan" must be translated to South Hill. I have never heard or seen that ship. It must have come in service after I left HK in the late 1960s. Was "Nam Shan" the last steamliner joined the fleet? Thanks for your posting about "Macau" which I had the opportunity to ride on once or twice. It was the luxuious steamliner of the era - Tak Sing, Tai Loy and Fat Shan were getting pretty old then. My parents were especially impressed by its "airplane like seatings" which provided great comfort and sleep when they were reclined. I believe the trip between HK and Macau took approximately 4 hrs. If it was an overnight run, the policy was to allow passengers to sleep till 7 a.m. before embarkation even tho the ship had been docked since 4 a.m. This would enable gamblers from HK to get some ZZZZ after playing all night at the casino(s). Permalink Submitted by tngan on Tue, 2010-05-18 16:42. I believe if you poke into your Web Browser settings there should be something like a Language setting, which should enable displaying a non-English website if configured correctly even if you are using an English version of operating system. My computer runs the English version of Windows XP Professional, but I am able to read and write Chinese. If you use Internet Explorer it would be in the 'Internet Options' dialog. There is a clickable button called 'Language'. Simply add the language you need below your default language should do. If you use Firefox it's in the Content Tab of the Options dialog. Other browsers should have something similar. Sure will give it a trial. Permalink Submitted by Anonymous (not verified) on Tue, 2010-05-18 17:59. Sure will give it a trial. It is really a hindrence for not having my computer Chinese compatible. My roommate is the computer expert and will ask him to do it for me when he returns home. Permalink Submitted by vanessa (not verified) on Tue, 2010-05-18 21:56.
i commuted on a regular basis between hong kong and macau 77-79 so travelled on all the various vessel types which plied the route. one particular trip stands out in my mind on the 7-7-77 (and yes, we listened to queen's seven seas of rye that afternoon) going to macau on the 'midnight ferry' mv lo shan. first we went to the 'poor man's nightclub' situ in front of the immigration shacks in what was the sheung wan bus terminus during the day. fun and games as you could eat, drink, shop and be entertained - canto pop, chinese opera, fortune telling, snacks, snake drinks - all the usual suspects. the market started to fold up just before midnight and then you waited patiently in line to proceed through immigration. once on the ferry the place was alive with people playing cards (with money on show), swearing big time, dabbling on the slot machines, slurping yet more noodles all in anticipation of 'paradise' just over the river. it was a lonnnng sleepless night and we were off the ferry by about 6 am which docked at the inner harbour. cost of the ticket? hkd$18 including tax for the privilege. Permalink Submitted by Joao Botas (not verified) on Wed, 2010-05-19 01:22. Permalink Submitted by Anonymous (not verified) on Wed, 2010-05-19 01:24. I know Tak Sing, Tai Loy and Fat Shan all had staterooms on the upper decks and then on the bottom deck (at the hull), there were canvas lounge chairs all lined up and we called that deck, "Dai Chun". My parents and I rode in "Dai Chun" once or twice when the staterooms were all sold out. "Dai Chun"was actually quite fun to be in because vendors were allowed to sell various hot food/snack and perform entertainments. I believe the fare was $3 HK or might be $5....it was very cheap. "Dai Chun" was meant for the lower income class ppl so nothing was elegant there. The "Poormen's Market" was another place to remember; does it still exist? Rumor was that dog meat was served there. It was basically a giant flea market at night and it was really fun to be in. Sigh! Those were the good ole days. I really wish we could turn the clock back to the 1960 and 1970s. All these so called progress, development and new skyscrapers are killing my city that I love so much. Permalink Submitted by Anonymous (not verified) on Wed, 2010-05-19 04:13. Your blog seems to be very interesting and I am like to read it. Unfortunately, it is in Portguese (I believe). Do you have an English version? Permalink Submitted by vanessa (not verified) on Wed, 2010-05-19 05:12. Permalink Submitted by Admin on Wed, 2010-05-19 09:26. Try using Google Translate to read it. It's not perfect, but you should be able to get most of the meaning. Permalink Submitted by Anonymous (not verified) on Wed, 2010-05-19 09:57. Thanks for the English version. Indeed, it is an interesting, educational and historical article to read. Thanks again for providing that to us. Permalink Submitted by vanessa (not verified) on Fri, 2010-05-21 03:24. Permalink Submitted by Anonymous (not verified) on Fri, 2010-05-21 04:59. When I visit HK again, I'll sure go see that model in Stanley. Lai Loy was the smallest and less known of the 3 ships I believe. So it was built in 1951 locally, as you said. I wonder if it was scraped after decommissioned. Permalink Submitted by Admin on Thu, 2010-05-27 09:41. Permalink Submitted by Anonymous (not verified) on Thu, 2010-05-27 14:14. What is "KinShan" in Chinese characters? Or at least, What is "KinShan" translated to in Chinese? Permalink Submitted by tngan on Thu, 2010-05-27 16:29. It was very likely [金山], Golden Hill. You should be able to lookup [省港澳 +金山輪] on Google with entries form other Chinese forums around. Permalink Submitted by Anonymous (not verified) on Thu, 2010-05-27 18:14. Great! Thanks for your reply. Permalink Submitted by Chris. Chan (not verified) on Mon, 2010-08-09 11:11. It was built in Wing On Shing Shipyard. The keel laying ceremony was done on 16th September 1948. After one year it was launched on 20th October 1949. Jennifer Sprague, daughter of the Mr. Sprague of the Marine Department, performed the traditional ceremony by breaking a bottle of champagne at the bow. At the same time, alice Fu, daughter of Mr. Fu Wai-Sum, the owner, simultaneously knocked off the release to launch the mw, Tai Loy. It was the largest designed and built ship in the coloney's Chinese shipyard since the war. Tai Loy was registered in 1950 as "Tai Loy" and the Registered Owner is Tak Kee Sg & Tdg Co. Ltd. and the port of berth is Hong Kong. 1968 it was re-registered with a new name "Chung Shan" and the Registered Owner is Tai Tak Hing Sg Co. Ltd. and the port of berth is Hong Kong. 1978 it was re-registered as "Hong Xing 801" and the Registered Owner is "Chinese Govt (Pearl River Sg Co.)" and the port of berth is Guangzhou. After that I have no more record of Tai Loy. Recently I found a photo album left by my father a full documentry of the ship when it was built till it was launched with newspaper cuttings. Permalink Submitted by stephen davies (not verified) on Thu, 2011-04-21 11:36. If you come to the HKMM in Stanley, on the ground floor of Murray House, you will find a splendid model of the Tai Loy made for the builders, Wing On Shing Co of Cheung Sha Wan, around the time of the ship's launch. With the model we have a fairly comprehensive pamphlet about the ship and its history which is free to museum visitors. Permalink Submitted by Peter (not verified) on Sun, 2011-06-05 07:57. My dad work on M.V. Tai Loy and M.V. Tai Shan back then, thanks so much for yours and everyone's post, I've been reading it over and over again. So many childhood memories. Permalink Submitted by Peter (not verified) on Sun, 2011-06-05 08:02. Mr. Chris Chan, is Peter again. By any chance you have some of the picture of this ship scanned and posted anywhere? I would love to see them. Thanks. Permalink Submitted by philk on Fri, 2012-04-27 20:34. Permalink Submitted by tngan on Tue, 2013-12-24 18:06. Currently reading Ian Fleming's Thrilling Cities. 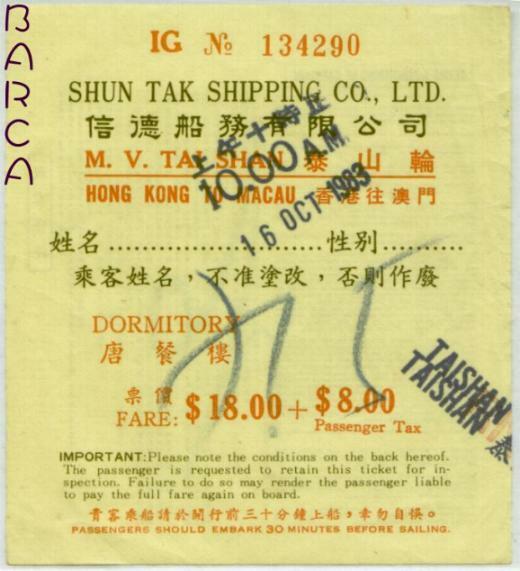 It would seem Fleming went to Macau on S.S. Tak Shing with Richard Hughes. He mentioned and I quote "These ferries are not the broken-down, smoke-billowing rattletraps engineered by whisky-sodden Scotsmen we see on the films, but commodious three-decker steamers run with workmanlike precision." Permalink Submitted by harryhktc on Sun, 2015-02-15 07:20. My lasting memories of the ferries during the 1960's were the huge Union flag symbols painted on their sides. Permalink Submitted by Lawrence Tsui on Sun, 2014-01-12 22:42. During the Japanese occupation, the steamer was renamed 'Nankai-201' (South Sea), later renamed again 'Koto Maru' (HK Island). It was diverted to operate between HK & Canton. Sailings were advertised in the Hong Kong News. 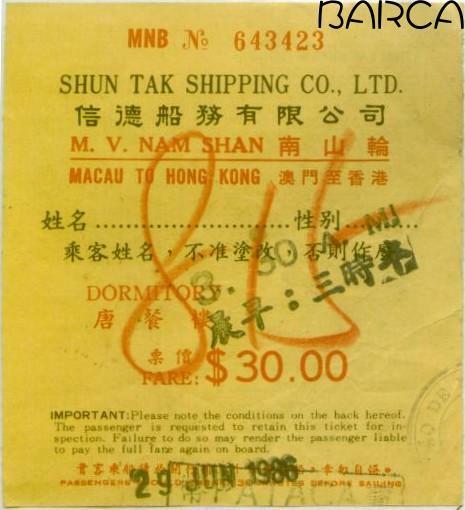 The operator was Hong Kong, Macao Canton Steamboat Company. BAAG Agents produced very good intelligence on enemy shipping & dockyards at this stage of the war. Permalink Submitted by Nona on Mon, 2014-01-20 13:43. Some girlfriends and I went to Macao last in 1966, travelling on the Fat Shan. Unfortunately the only photo I took on board doesn't show very much of the deck but I found one of when my parents took us over in 1951. Could this be one of the steamliners to Macao? Permalink Submitted by cmshun on Sun, 2014-02-09 22:53. I was told that this postcard was dated in the 1920s but I am not sure. I recall seeing this postcard on the internet but cannot find the source now. The postcard is labelled as "Hong Kong - Entering Port Through Sulphur Channel" and published by Raphael Tuck & Sons. Permalink Submitted by philk on Tue, 2015-02-10 20:00. I just found out the Tai Loy was renamed the Chung Shan in 1968. You can see it here in 1975 when it was used during the making of Emmanuelle 2. Permalink Submitted by philk on Wed, 2015-06-17 15:23.
and here is a picture of the Tak Shing taken from 1955's Soldier of Fortune. Permalink Submitted by Chris. CHAN on Tue, 2016-02-23 03:55. The keel blocks are ready for Tai Loy in Wing On Shing Shipyard in Sep. 1948. Newspaper cutting regarding the Keel-Laying for Tai Loy in Wing On Shing Shipyard. Another newspaper cutting regarding the Keel-Laying ceremony.The gentleman on the top photo is Mr. Harry Cheng Cheong, representative of the ship owner. First sight of Tai Loy's keel. Close look of Tai Loy's keel (Stern). Close look of Tai Loy's keel (bow). Jennifer Sprague, daughter of Mr. W. Sprague, senior surveyor of ships, Marine Department, performed the traditional ceremony of christening the ship by breaking a bottle of champagne at the bow. At the same time, Alice Fu, daughter of Mr. Fu Wai-Sum, the ship's owner, simultaneously knocked off the release to launch the m/v Tai Loy. The launching of m/v Tai Loy. The speaker is Mr. W. Sprague, senior surveyor of ships, Marine Department. The second on the left is the ship's owner, Mr.Fu Wai-San. The guests at the ceremony. My grandfather is in this photo, he is the one in white suit standing next to Mr. Sprague. At the back is the Wing On Shing Shipyard's office. Newspaper cutting of the launching of Tai Loy. After many years of service. The scaled model before it was donated to the Hong Kong Maritime Museum. It had been in Wing On Shing Shipyard's office since the launch of Tai Loy in 1949. The plaque for the 1:48 scaled model showing the specification of Tai Loy. Permalink Submitted by David on Tue, 2016-02-23 01:42. If you know the location of the Wing On Shing Shipyard, please could you make a Place page for it (http://gwulo.com/node/add/place) to show us where it was? Permalink Submitted by Chris. CHAN on Tue, 2016-02-23 04:18. I cannot add the location in your "Place" due to I cannot get access to Google Map in China. At the moment I am stationed in China. I can give you a rough idea the location of Wing On Shing shipyard, it is on top of the MTR Cheung Sha Wan station. The photos I posted on your web site is only part of Tai Loy's photos collection, less than half of it. I can do a presentation of Tai Loy if there is enough audiance. Those photos are of lower resolution and my original photos are of higher resolution and in TIFF file format. Permalink Submitted by Chris. CHAN on Thu, 2016-02-25 01:41. The model of Tai Loy is now on display in the new Mamaritime Museum in Pier 8, Central Harbour Front. There is some confusion regarding the date of build of Tai Loy. Actually the building of the ship was finished in October 1949. The launching date was 20th October 1949. The scaled model was built in 1951 according to the plaque in the display box. Permalink Submitted by Admin on Sun, 2016-02-28 00:48. Permalink Submitted by Chris. CHAN on Fri, 2016-03-11 15:37. I tried to move the location marker but without any success. So I attach a copy of the map with a blue rectangle to indicate the location of the shipyard. Please move the red marker accordingly. Thanks ! Permalink Submitted by Admin on Mon, 2016-03-14 11:57. Thanks Chris, I've updated the marker's position.